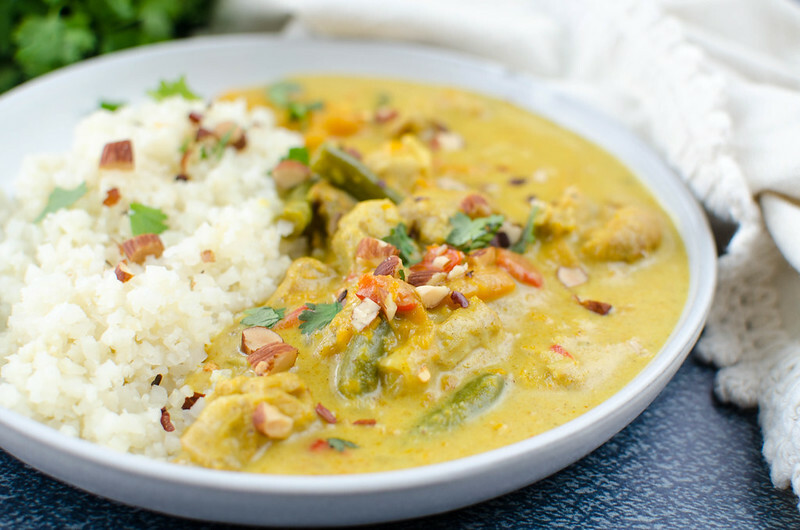 Pressure Cooker Paleo Sweet Potato Chicken Curry – chicken thighs, sweet potatoes, green beans, and peppers in a delicious coconut curry sauce. Ready in less than 30 minutes! Great for meal prep! I gave in and got a pressure cooker. I didn’t really understand why everyone was obsessed. Like, for the last year whenever anyone found out what I do for a living, their first question was if I had any pressure cooker recipes. Okay, so it cooks fast? And? But you guys. I made this chicken pho broth in 20 minutes. And it was rich and gelatinous and it would’ve taken hours to get anything like it from the stovetop. I made it the day I got the pressure cooker and haven’t stopped talking about it. Boyfriend had a friend over the other night and I pulled the pressure cooker out from under the counter to show him. 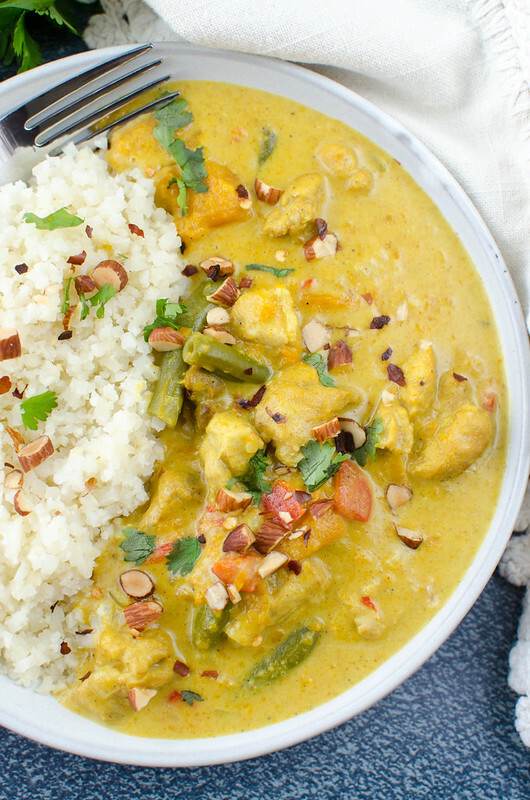 Pressure Cooker Paleo Sweet Potato Chicken Curry! I’m obsessed with this recipe and yes, I’m going to tell you how fast it cooked. Several times. I’m one of those people now. To be fair, it takes a few minutes to heat the pressure cooker up but really, it was less than 20 minutes from start to finish. And you know how when you’re cooking something on the stove, you kinda babysit it? Walk by, give it a stir, all that? I love that there’s none of that with the pressure cooker. Put it all in, walk away for a few minutes, and know that it’s going to turn out perfect. And did I mention, 12 minutes for the most tender chicken thighs you’ll ever have in your life? 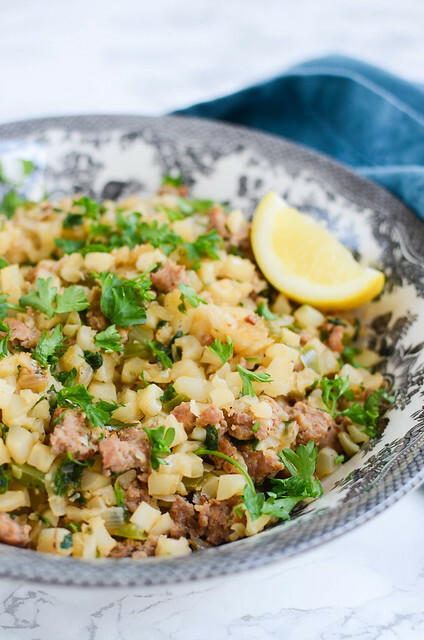 It’s a paleo recipe so all the ingredients are simple and fresh and healthy. 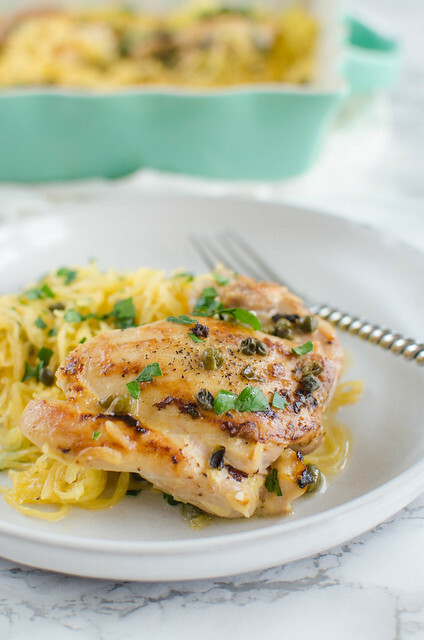 Just the chicken thighs (you can use breasts if you want but thighs are so much better – and less expensive! ), sweet potatoes, green beans, red bell pepper, a handful of spices, and coconut milk stirred in at the end. The sweet potato almost melts into the curry which gives the sauce a rich texture and a tiny bit of sweetness. I added some chopped almonds on top for a bit of a crunch and then some crushed red pepper flakes for some heat. I can totally see myself meal prepping this every week. It held up great in the fridge and reheated perfectly. 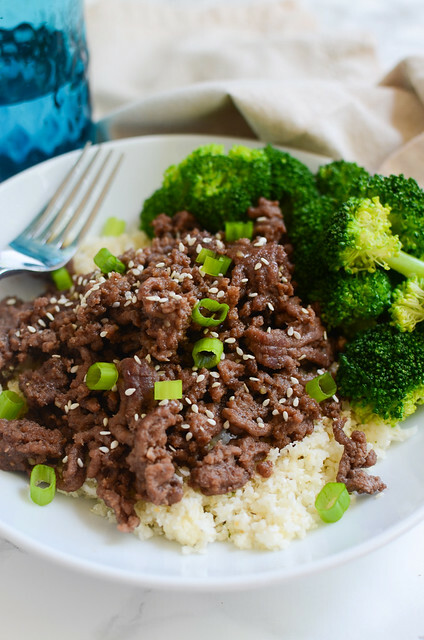 Just add some cauliflower rice (or regular rice) and you’ve got a delicious meal! Set your pressure cooker to saute setting. Add coconut oil. Once melted, add onion and cook, stirring frequently, until softened and translucent. Add garlic and cook until fragrant, just 30 seconds. Stop saute setting. Add chicken thighs, sweet potato, green beans, red bell pepper, curry powder, turmeric, cumin, salt, black pepper, and chicken broth. Seal pressure cooker and set to high for 12 minutes. Once done, carefully quick release the steam. Set pressure cooker to saute and stir in coconut milk. 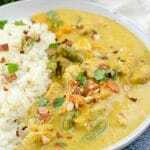 If the curry isn't thick enough, stir arrowroot into the water in a separate bowl and stir into the curry. 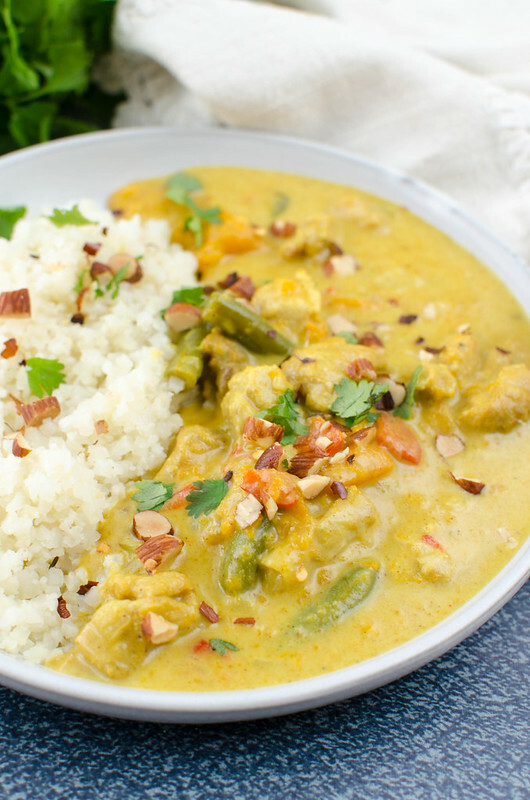 Divide cauliflower rice among 4 bowls and top with curry. Sprinkle with cilantro, chopped almonds, and crushed red pepper, if desired. 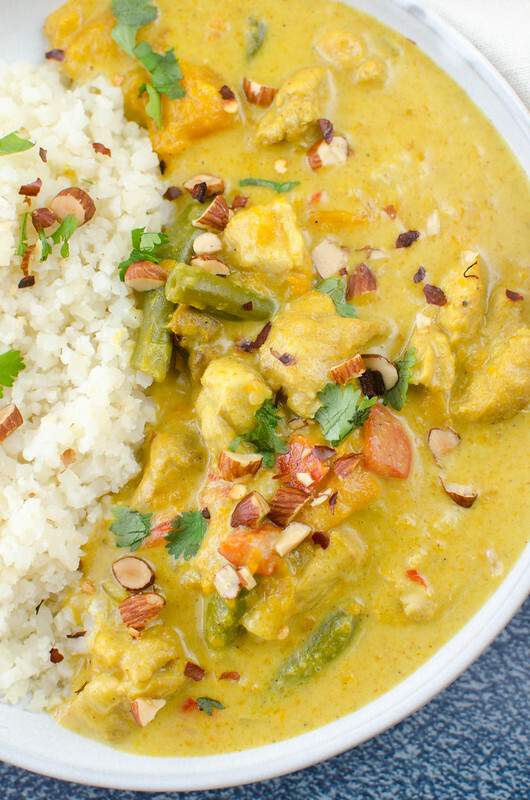 One Response to "Pressure Cooker Paleo Sweet Potato Chicken Curry"
I’ve been resisting buying one. Thanks for the review and the yummy recipe!